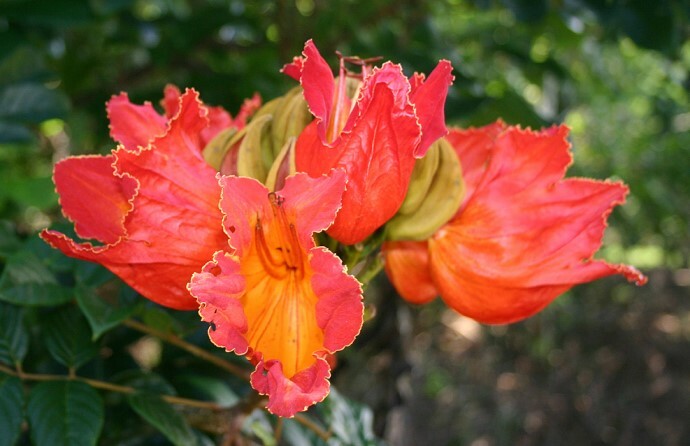 The African Tulip Tree (Spathodea campanulata) is a shade-tolerant, evergreen tree native to equatorial Africa. It is a member of the Bignoniaceae Family, which includes the Jacaranda (also growing on Maui). It is also known as Flame Tree, Fountain Tree, Indian Cedar, and Santo Domingo Mahogany. Though it was originally introduced as a domesticated ornamental tree, the African Tulip Tree has escaped cultivation and invaded agricultural land, forest plantations, and natural forests; it is now one of the dominant canopy trees in all of Hawaii’s rain forests and has become a serious threat to the biodiversity of that ecosystem.